Just to set the record straight, you can put enchants on these that require a higher level. They don't become active until you reach that level though. 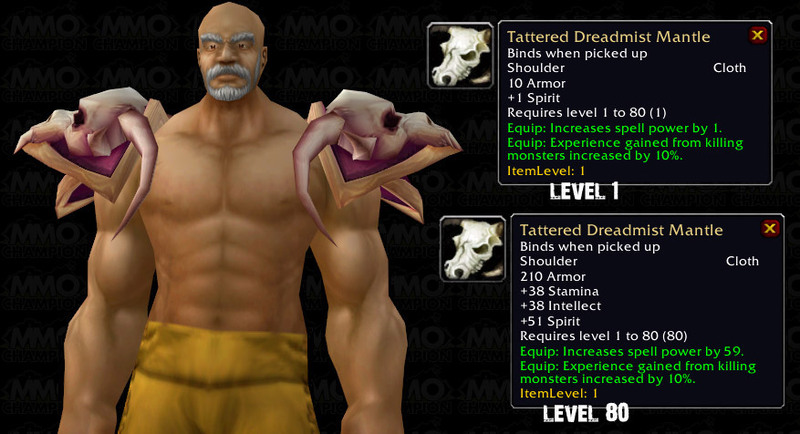 I assume blizz did that with this and the head slot BtAs since there's not much of shoulder/head enchants for ilvl 1s. Everything else (chest, back, weapon, ring ) can only accept enchants that don't have a level requirement. Also Wrath shoulder enchants don't work, only Vanilla and TBC ones do. I personally have Große Inschrift der Kugel on mine, so I know it works. 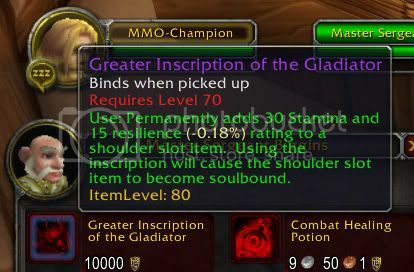 well the only shoulder enchant that worked with this heirloom was Zandalarisiegel des Mojo or Zandalarisiegel der inneren Ruhe ZANDALAR tribe exalted rewards from vainilla Zul Gurub, but this faction was removed from game in patch 4.0. Zerlumpter Mantel der Furcht replace with Exquisiter Mantel des blinden Sehers. Attacke des würdevollen Direktors replace with Großstab des Jordan. One of the Scharfes Auge der Besties replace with Geerbtes Insigne der Horde or Geerbtes Insigne der Allianz (depending on your faction). With the new heirloom upgrade system introduced in patch 6.1 this item has been replaced by Zerlumpter Mantel der Furcht.